When it comes to Christmas presents for dogs, there are a lot of choices out there. Of course, your dog isn’t going to know that it is Christmas, but when he or she sees everyone else opening gifts and the joy that comes from them, then he will want to experience that joy as well. The problem is, there are so many choices out there that it can be difficult to narrow them down. That’s why we have come up with this buying guide that will help you choose the right Christmas present for your dog. We will also be looking at the top five puppy Christmas presents currently on the market. Let’s take a look at five of the best Christmas presents for dogs. These are perfect for all sorts of breeds including the very large like Great Danes, as well as the very small such as Poodles and Yorkshire Terriers. They also work with medium-sized dogs like Boxers, Siberian Huskies and Doberman Pinschers. They are all great choices when it comes to the best dog Christmas presents. 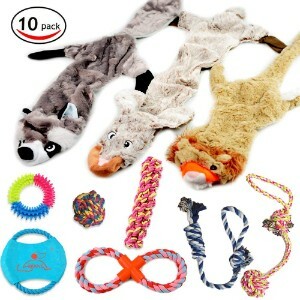 This dog toys gift set is made by Lobeve and comes with the ton of cool stuff that your dog will love. There are a couple of advantages to going with this gift set over another. For one thing, you have two different gift sets to choose from. That means that if you bought the same gift set last year for your dog, or you have two dogs, you can get them to completely different sets with different toys. This is a 10-pack, which means there are 10 different items that you will be giving your dog if you buy this for their Christmas gift. All of the playthings are squeaky toys that your dog will love. Three of them are plush toys that come without stuffing with the main set incorporating a rabbit, a raccoon and a lion; then there are three rope toys that you can play tug-of-war with your dog over, a toy ball for your dog, a dog flying disc and a rubber ring. If you don’t like the first package, then you can go with the second and you can either give them all at once to your dog or you can hand them out one at a time and see what they like better. The beauty of this gift set is that there are so many different toys and so many different types of toys that you are sure to find something that your dog is going to absolutely love. All you need is one single toy that your dog is going to adore for you to make their Christmas. There are lots of options out there when it comes to Christmas gift packages, but this is definitely one of the best choices currently on the market. This holiday gift set from Blueberry is perfect whether you want to give a gift to your pet or you want to get them as a gift to a pet owner. That’s because it is a customized collar that you can engrave a pet’s name on right in the leather tag on the side of it. There are a few things that make this unique among all of the dog collars that are on the market. The first is this comes from Blueberry, one of the top brands out there when it comes to pet supplies and accessories. If it is Blueberry, then you know it is high quality and your pet is going to love it. Another terrific thing is that this comes in many different sizes. You are sure to find the perfect size for your dog because there are so many different ones to choose from. You also do not have to go necessarily with the customized collar, but even if you do not, you get to choose from more than a dozen different Christmas designs to give the perfect gift. Your choices as far as collar size include small, medium and large, as well as customized sizes for the personalized writing. There are also additional accessories included such as a leash and a bowtie for your dog. But blueberry doesn’t just make terrific Christmas collars; they make customize collars for all occasions including Halloween and Thanksgiving. 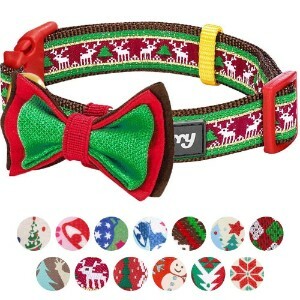 The real benefit of this collar is that you are able to get it for any occasion with total customization, and it is made with polyester webbing to match the reindeer design ribbon with the metal D-ring that is coated with gold for added durability. This is definitely one of the top Christmas gifts out there for both your own dog and for dog owners that you know. 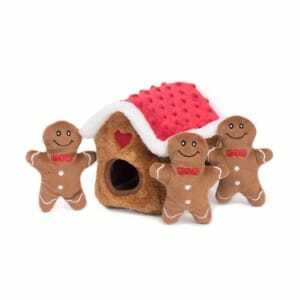 From ZippyPaws comes this amazing gingerbread family that makes one of the best gifts for dogs this Christmas. When it comes to Christmas accessories for dogs that they will love playing with, these are definitely some to consider, because they are interactive chew toys that far exceed the playability of most of the chew toys out there. Plus, since they are a gingerbread family, not only do you get plenty of them to play with, but you also get a wonderful Christmas theme that you will love. Let’s take a closer look at this interactive squeaky hide-and-seek plush dog toy collection. The first thing to know about this gingerbread family is that it comes with four different pieces. Three of the pieces are appropriate for any size dog you can imagine, while the gingerbread house itself will also work for smaller dogs, but is mainly intended for medium-sized dogs. Smaller dogs may have a bit of a harder time getting their mouth around this chew toy, but they will build a play with all the rest with no problem. The squeaking this of these chew toys is loud and interactive. Your dog will pounce on them immediately after you present them, and it will become one of their favorite toys all year round. These are extremely high-quality toys, and they are going to last for many months even if your dog is a major chewer. These gingerbread chew toys are perfect for any dog, even the largest dogs, because they are durable and unlikely to tear and offer a great deal of interactivity that will make your dog excited about playing with them. If you want a great Christmas present, then this is definitely one to consider. If you are going to fill your dog’s stocking this season, then consider this complete Christmas stocking for dogs. Many people wish to fill their dog stocking themselves, but for those that are too busy or who want to save money on stocking stuffers, this is a really great solution. You can either hang the stocking up by itself, or you can empty it out and put it in your dog stocking. In either case, your dog is going to love what is included with this stocking stuffer package, because it is filled to the brim with everything that your dog will want to play with. For example, this holiday dog stocking has four different rubber squeaky toys that your dog will be playing with immediately after introducing them. First, there is the ‘doggy news’ rubber squeaky toy that is in the shape of a newspaper, giving your dog their very own section of the news to bite and chew to their heart’s content. Then there is a rubber squeaky yellow boot that will prevent them from chewing on your actual shoes. If your dog has his own shoe or boot to chew on, then he is much less likely to play with your actual shoes. There is also a Christmas colored knotted rope that you can play tug-of-war with your dog. A knotted rope is a great gift for a dog because they are able to latch their teeth onto the knots and hold on tightly so that you can easily play tug-of-rope with them. Anyone who has ever played tug-of-rope with a knotted rope knows that you have an even chance of getting the rope back from your dog with this type of toy, which makes it more pleasurable for your dog. There is also a tennis ball that will allow you to play fetch with your dog. The best thing about this particular stocking gift is that it is so inexpensive. In fact, it is about the same price as any chew toy that you would buy at your local department store. Giving your dog a toy is one of the best ways that you can celebrate Christmas. But how do you know what kind of toy he should give them? The answer is a high-quality toy that they are going to love for a long time to come, and something that they are not going to get bored playing with. That’s exactly what the next offering on our list is. This is squeaky toy that is going to ensure their happiness for the next few weeks or months, and it will be one of their favorite toys even among all the others that you give them. That’s exactly what makes a perfect Christmas gift. 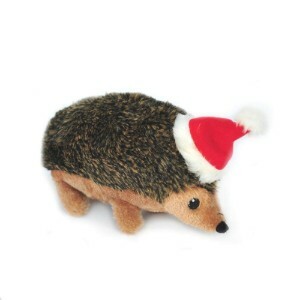 You want your dog to have something that they are going to love and this hedgehog squeaky toy comes in three different sizes to allow you to choose the perfect one for your dog’s mouth and give them something that is so durable and long-lasting that they will be chewing it and squeaking it a full year from now. This is one of the fun and festive holiday toys that you can find on Amazon, with each toy having its own loud noisemaker; and this particular one is decorated as Santa with a removable Santa hat. There are lots of chew toys out there for dogs, but this is one of the best. You will be able to fill your dog with love by giving them this chew toy and making sure that they have something that they are able to use for exercise, relieving anxiety and even honing their teeth for good dental health. Besides the specific ideas listed above, there are lots of categorized ideas that we will be looking at. Christmas presents for dogs can be almost anything, but there are some that are definitely going to be more effective and more loved than others. There are a few things that you want to look for when buying a dog Christmas gift. First, you want to make sure that the Christmas present you get is something that your dog is going to like. But it should also be something that your dog needs. In other words, it might be something that you were planning to get for them at some point anyway. It should also be something unique that they are going to recognize as a special gift. If you give your dog a treat from the dog treat bag a few times every day, then they cease to become dog treats. That’s why whatever Christmas present you choose should be something really special that your dog is not going to expect and will really like. There are some great ideas below. These are doggy Christmas gifts that will be great investments for yourself, as well as terrific presents for your dog. It all depends upon how practical you want to be with your Christmas gifts. First, consider getting your dog an upgraded dog bed or dog house for Christmas. There are lots of options when it comes to dog beds. Depending upon the size of your dog, and the behavior, your dog bed might be large and tough like an indestructible dog bed, or you might want to go with something really fluffy and warm. Most of the time, your dog wants some kind of bed that they can curl up in, with walls that give them a sense of security. However, this may not be practical if your dog is too big. But if you have been thinking about getting your dog a new bed, getting him something that is more expensive and comfortable than you would’ve gotten ordinarily might make a perfect Christmas present. Of course, you could also go with a dog house, or with a new dog house you already have one. The great thing about dog houses is that they allow your dog to have a safe space that they can go into and feel secure when they are anxious. In fact, you normally want to combine your dog bed with the doghouse. If you already have a dog bed, then you can upgrade your dog house and put the old dog bed in there, and then use the new dog bed indoors. A dog house should be large enough for your dog to stand up in and turn in a complete circle, but no larger than that. If you don’t already have one, this can be a great gift for your dog. You may also want to combine it with a dog ramp if your dog has trouble getting up into dog houses due to age or illness. Outdoor fencing or outdoor playpens or kennels can be one of the best gifts you give your dog. This is something that you probably want to combine with an electronic dog door, but an outdoor dog kennel or dog playpen can be a terrific thing for the dog that does not get enough exercise. Depending on the breed of your dog, you may need a smaller or larger dog kennel outside, or you may not be able to make use of your yard for large dogs if it is very small, but most of the time, even a smaller backyard is going to make just about any breed of dog happy including Golden Retrievers, French Bulldogs, Beagles, Rottweilers and Boxers. The reason that fencing or an outdoor kennel is such a great Christmas gift is that dogs love to play outside, and not every owner has the time needed to take them out there. If you can spend a little money to install a dog door and fencing for your backyard, allowing your dog to enter and exit as they please and go out and play whenever they want, you will have a much happier dog. However, you are also going to find it more convenient for yourself because you don’t have to get up to let your dog in an out whether that is to exercise or to use the restroom. The only problem with this is a Christmas present is that your dog may have to wait until spring to enjoy it fully. Getting your dog a costume or dog clothing is another great idea when it comes to holiday gifts. Some clothing accessories are actually more practical, such as cooling vests for dogs or cooling pads for dogs, dog activity monitors or GPS tracker for dogs that attaches to the collar, or various other things that your dog can wear that serve an actual purpose. But there are also actual dog costume options that you have to choose from. Getting your dog a costume that you can use to go to parties with or cosplay together can be one of the most rewarding experiences of both of your lives. There are lots of costumes out there that will fit both you and your dog, including costumes from some of your best-loved TV and movie franchises, from some of the pop-culture characters that make up the cosplay at comic book conventions these days and lots of other ideas as well. Of course, a dog costume doesn’t necessarily have to be an actual costume. There are lots of outfits out there for dogs as well. You can get your dog a sweater, a shirt, a bandanna or lots of other clothing items. This can be a terrific Christmas present for your dog, especially if the clothing hugs them and keeps them from experiencing anxiety. There are tons of gift fight is that you might want to consider for your dog. Of course, you could go with a new dog bowl or automatic dog feeder, but there is a lot more out there that you can get for your dog for Christmas than just the standard items. There lots of reasons why you might want to get your dog toys and playthings for Christmas. The first reason is that they promote exercise. Having the right dog toy will encourage your dog to exercise, get their heart rate going, raise their blood pressure and in general promote better health. Another reason that dog toys are so popular with dog owners is that they provide intellectual stimulation. They are really great for your dog’s brain health, because they give them something stimulating to think about. There are lots of toys out there, from stuffed animals that they can chew apart, to squeaky chew toys and even some interactive toys that your dog will really enjoy for hours on end. Puzzle toys and interactive toys for dogs are some of the best Christmas presents out there. Depending upon the toy that you get, other benefits may include bonding with your dog if you play with them and their toys, as well as promoting good dental health. Another idea is to get dog treats, chews and bones in order to promote dental health and give your dog a number of other benefits. When it comes to Christmas presents for dogs, this is probably one of the best ideas out there because getting a chew, treat or a big huge bone is probably going to make your dog the happiest. If you can get them a bone that they can gnaw at for hours upon hours, you will be providing them a Christmas present that is akin to a stocking filled with candy for you. Of course, dog treats are always popular among dogs, and giving your dog some dog treats on Christmas could be a great present for them. However, the problem with dog treats is that many people use them for training. If you give your dog too many treats on Christmas, then they are going to be less effective when it comes to training. That’s why it might be a good idea to skip this particular item. If you want to give dog treats as a present, then make sure that you are giving them a completely different flavor than the ones used for training. Automatic Ball throwers are one of the best Christmas present that you can get your dog. Automatic fetch machines allow your dog to play fetch over and over again without you even having to be there. The way that they work is that they launch a tennis ball indoors or outdoors for your dog to chase down. The usually have adjustable distances such as 10 feet, 20 feet and 30 feet, and the size of the ball varies depending up on the machine. Your dog chases down the ball, brings it back and drops it into a bowl or pan of some kind where the ball reloads and shoots back out of the machine again. You do have to train your dog on how to use automatic ball throwers, but it is well worth it because this is a toy that they can activate themselves simply by dropping the ball back into the machine and waiting for it to launch. They can do this over and over again whenever they feel like playing. Of course, you can still play fetch with them outside, but this is a handy replacement when they are home alone and allows them to get rid of pent-up energy, keep their mind busy and avoid feeling anxious as well as get some extra exercise in addition to the exercise that you give them on their walks. That’s why automatic fetch machines have become such a popular Christmas gift for dog owners. Dog treat boxes are a relatively new offering on the market, capitalizing on all of the success that other gift boxes have had in recent years. Gift boxes are basically filled with items that match a certain theme, such as a gift box for science-fiction fans, a gift box from booklovers or a gift box for cooking enthusiasts. But there are also plenty of gift boxes out there for pet lovers – especially dogs. Dog treat boxes are gift boxes that arrive once a month and contain all sorts of things that your dog will love. They may have brand-new products that you haven’t had the chance to try, and may never get the chance to try again, and they will also include toys, accessories and lots of other stuff for your dog. One of the most popular right now is BarkBox, which has been advertising heavily on television, and this particular box is only about 20 bucks a month and arrives every 30 days packed to the brim with treats, toys, dog accessories and all kinds of stuff that your dog will love. You do not have to sign up for a long-term contract with most of these dog treat boxes, so you can order one for Christmas if you like, especially since the Christmas box is usually even bigger than the regular boxes. Another thing you may want to consider is a day of pampering for your pup. There are dog spa places out there where you can drop your dog often they can get pampered for the day. Just like going to a human spa, every need will be met and they will be paid attention to in pampered throughout the entire day. These are definitely one of the higher end Christmas gifts for your dog, but if you can afford it, they are really a unique Christmas gift that your dog will appreciate. A simple substitute is sending your dog to the groomers for the day. Getting their hair trimmed and combed by someone that knows what they are doing can be a wonderful experience for some dogs. You can look around your area and find out what is available when it comes to dog spas. You will be able to find out what it is they offer and what they charge. Most big cities have lots of dog spas to choose from, and even more rural areas have a least one within reach. You will have to do some research and find out if a dog spa or dog pampering is perfect for your dog for Christmas. The bottom line is that there are plenty of things to keep in mind when it comes to getting your dog the perfect Christmas gift. You want to find them something that they are going to love for many years to come, and something that they are going to take to right away. Giving them a Christmas gift is important because on Christmas day they are going to see all of the joy that you will be experiencing by the gifts that you are giving and getting. They want to be part of that joy. That’s exactly why choosing the right Christmas gift for dogs is vital. You have lots of options out there, but hopefully, this buying guide will allow you to narrow down your choices and even pick from among the ones that have been reviewed here to get the right gift for your beloved puppy.